Soupure – Is Souping the New Juicing? Please The Palate is about great food and drink. We are constantly on the go, looking for palate pleasing experiences. Of course, all of this eating out (and drinking) can take a toll on the body. Personally, I work out regularly and eat pretty simply when at home. But, sometimes, you need a little jump start. I love juice but am not a fan of juice cleanses. These fads are just that. Most of the juice cleanses out there are very low in calories and leave you hungry, grumpy and deprived. Sure, you may drop a few pounds but as soon as you start eating solid food, you gain them back. So, when we heard about Soupure, we were equally skeptical. Afterall, swapping juice for soup didn’t seem all that different and a cleanse is a cleanse, right? Well, perhaps not. Soupure consists of nutrient rich cold and hot soups, tonics and waters made from organic, fiber and protein rich ingredients that are absolutely void of fillers and emulsifiers. Unlike juices, which throw away the vital fiber matrix and render many vitamins and minerals useless, the soups of Soupure are filled with macro-nutrients, such as protein and good fats. The soups are made with 100% fresh, unmanufactured, pesticide-free, non-gmo, and fiber-rich ingredients and have lower calories, reduced sodium, and phenomenal taste. While all of the soups and tonics are available a la carte, Soupure also offers cleanses – 1 day, 3 day, 5 day and a mini 3-day cleanse. During the cleanse, you get to enjoy all of the healthy benefits of whole fruits and vegetables while getting rid of toxins and impurities….and losing weight! After looking at my calendar, I found three free days in a row in which I had no plans to go to any restaurants or bars. I decided to try a 3 day cleanse and see what would happen. 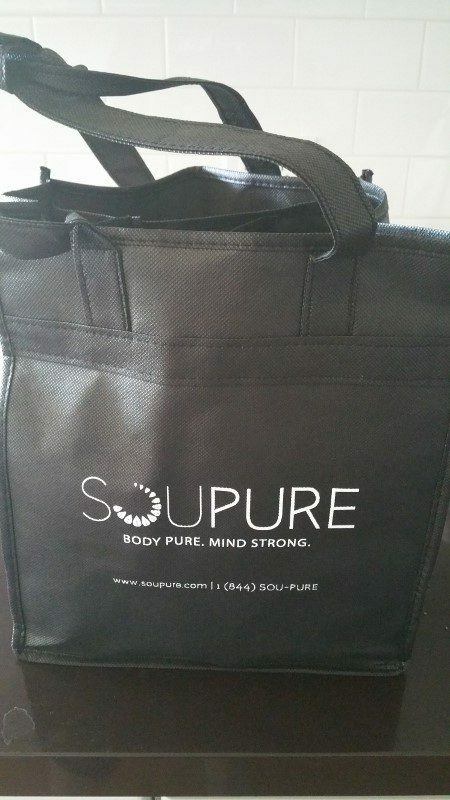 I ordered the Soupure in advance and it was delivered to my home the day before I started. Each day consists of 8 soups and tonics, which are made fresh. As they are all natural, they do not have a long shelf life and must be consumed within a few days. They arrive in simple glass jars in a black carrying bag. Each day, I woke up and started with a pear yuzu water Reboot. I then warmed up the Soothe and enjoyed some chicken broth before heading to work out. After working out, I came home and drank a Superhero, a cold soup made of nuts and seed. For lunch, I warmed up the Heal and enjoyed zucchini basil soup that is heavy on the garlic. In the afternoon, the snack was a tasty strawberry cashew Energize. For dinner, the soup was a warmed up Restore made from Japanese sweet potato. The day also included Clean, a pineapple basil water and Blackout made with banana and black sesame which could be drunk at any time during the day. With a variety of flavors and forms, raw and not raw, the 3 day cleanse was pretty easy. Day 2 was the most challenging day as it was the one day that I had a dull headache. But, by Day 3, I felt energetic and great. And the result? Well, in 3 days I lost 4.5 pounds. But, the best part is that 3 weeks later, I have still not gained the weight back. So, perhaps souping IS the new juicing as it is a healthy, nutritious way to feel good without sacrificing flavors. 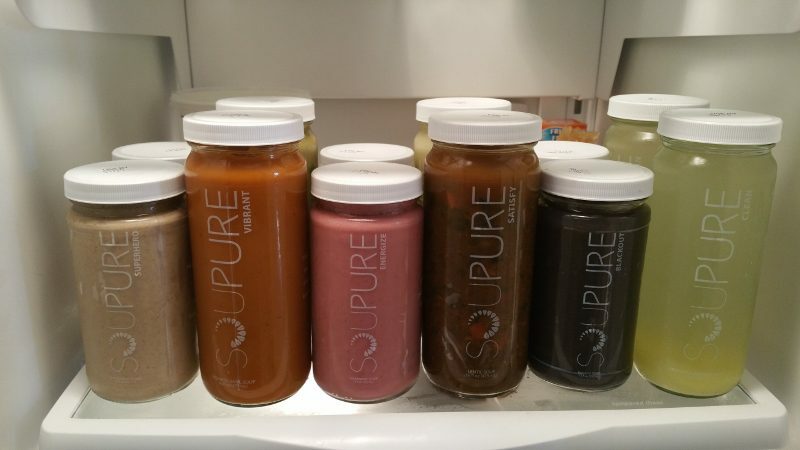 With delivery available throughout most of Los Angeles, try Soupure today! 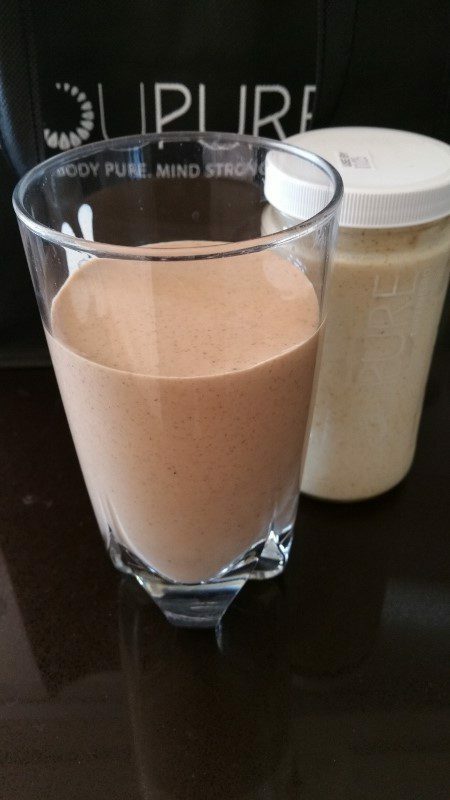 This entry was posted in Food, Lifestyle and tagged 3 day cleanse, cleanse, juicing, Los Angeles, soup cleanse, souping, Soupure by Allison Levine.